Zimbabwe's Information Minister Jonathan Moyo has defied his party by registering to be an independent candidate for March's elections. As a result, the minister has been sacked from the cabinet and the Zanu-PF party, President Robert Mugabe said. 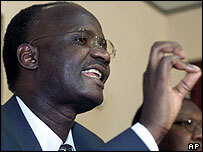 Mr Moyo had been barred from running in the Tsholotsho constituency as it was reserved for a woman Zanu-PF candidate. The decision was said to be linked to a row over Mr Mugabe's choice of candidate for vice-president. People cheered on Mr Moyo as he handed in his nomination papers on Friday. Mr Mugabe said Mr Moyo's decision meant he "automatically ceases to be a member of Zanu-PF, the party which sponsored him into government in the first place". The country is due to hold parliamentary elections on 31 March. Mr Moyo was disciplined by Zanu-PF in December and dropped from the top policy body after campaigning against Mr Mugabe's choice for vice-president, Joyce Mujuru. Mr Moyo is the architect of tough media laws, which have seen the expulsion of foreign correspondents, the closure of the most popular daily paper and the threat of prison terms for journalists who work without a state licence. 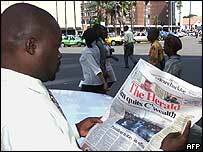 Senior Zanu-PF officials at the nomination court were surprised by Mr Moyo's action, the BBC's Themba Nkosi reports. Opposition supporters enjoyed the scene and even greeted him and shook his hand. Tsholotsho, in western Zimbabwe, is currently held by the opposition Movement for Democratic Change, but observers say the seat could fall to Mr Moyo who comes from the area and is popular there.